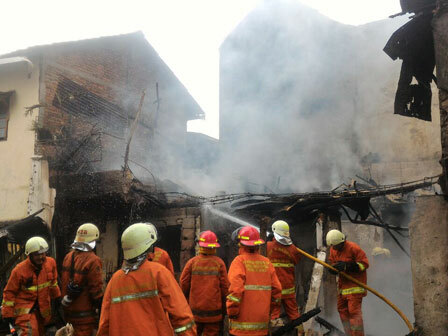 Along January-August 29, it has been noted that there are 98 fire cases in Central Jakarta. It is mostly because of electricity short-circuit.
" It is mostly due to electricity short-circuit and electrical device with 68 cases"
In the incident, the highest fire case is experienced by Senen Sub-district with 23 cases, Gambir Sub-district with 14 cases, Tanah Abang Sub-district and Johar Baru Sub-district with 13 cases, Menteng Sub-district with 12 cases, Sawah Besar Sub-district with 9 cases, Cempaka Putih Sub-district and Kemayoran Sub-district with 7 cases. "It is mostly due to electricity short-circuit and electrical device with 68 cases. And it's followed by stove blast with 12 cases and so forth," said Hardisiswan, Head of Central Jakarta Fire Handling and Rescue Sub-dept., Tuesday (8/29). He urges local people to be more wary of considering it is now entering the dry season. And usually it causes the frequency of fires to increase. "Usually fire frequency is increasing during dry season. If you see fire, please contact our call center at 112," he closed.